The Disney Minnie Mouse Activity Desk with Paper Roll from Delta Children gives budding artists plenty of inspiration. 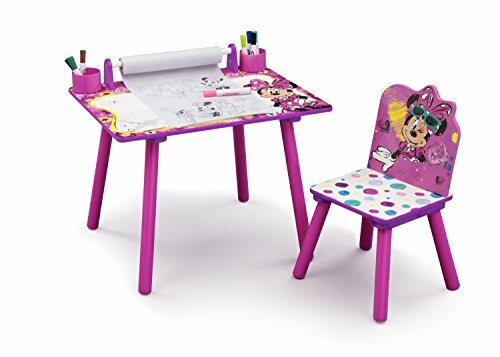 Featuring a spacious tabletop with dry-erase surface and paper roll printed with ready to color Minnie Mouse images, this desk and chair set is the perfect gift for any Minnie fan. Plus, built-in storage for art supplies keeps everything contained in one convenient spot. About Minnie Mouse: Sweet, stylish and a lover of all things polka dot, Minnie Mouse spends her free time dancing, singing and hanging out with her lifelong sweetheart, Mickey. Help bring her cheerful spirit to your little one's room with this item from Delta Children's colorful collection of Minnie Mouse kids' furniture.